A quick story about a cannon, a Cup, and a rivalry. In 1835, Texas wasn’t yet America. It wasn’t even really Texas — yet. It was Mexico, and had been for a good while. But things were changing fast. American colonists — self-styled Texians, not Tejanos, a distinction very important to the former — had been steadily moving in to the region in the early part of the ninteenth century, mingling their traditions and cultures with those of the Mexican regime. By 1835, Texians were feeling increasingly at home in their new land. In Gonzales, a small Texian settlement in the southeast, colonists had initially been given assistance from the Mexican government, in the form of artillery – a bronze cannon, in particular. With native Indian raids common, the cannon was meant to allow the fledgling town to protect itself, and by extension, Mexican territory. But a few years after that gift, political attitudes had changed. Those in Gonzales, like many around Texas, were growing anxious. They chafed against the idea that they represented Mexico, and resented feeling subservient to Mexican governance and culture. Many felt ready to stand on their own. Across the territory, settlers started making their feelings plain; curtailed compliance led to overt resistance, and even to outbreaks of armed revolt. 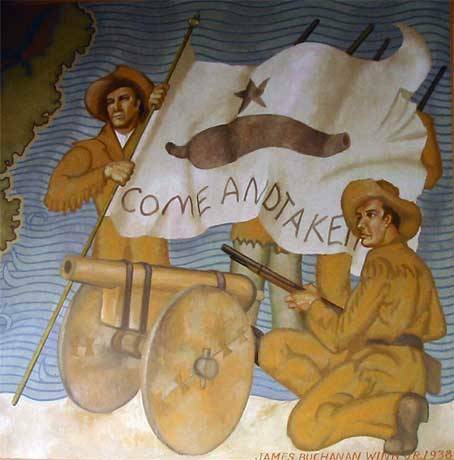 After a brief skirmish, [Mexican Lieutenant] Castañeda requested a meeting with Texian leader John Henry Moore… [Later, as] Moore returned to camp, the Texians raised a homemade white banner with an image of the cannon painted in black in the center, over the words “Come and Take It”. Realizing that he was outnumbered and outgunned, Castañeda led his troops back to Béxar. This was one of the first US-Mexico staredowns, but by no means would it be the last. The Battle of Gonzales kicked off the Texas Revolution and led to Texas gaining its independence, and ultimately to it joining the United States. Ever since I learned about Gonzales, the cannon, and “Come and Take It”, I’ve loved it for one particular reason: I’m a huge US Soccer fan, and the story resonates perfectly with that of the Mexico – United States soccer rivalry and the battlefield on which it’s usually contested, the biennial CONCACAF Gold Cup tournament. The Gold Cup is almost here, and “Come and Take It” is, in many respects, the ultimate regional rallying cry for US Soccer. “It”, of course, is our mutually contested “cannon” – the Gold Cup itself – which the US currently possesses and must defend. (To the chagrin, no doubt, of Mexican fútbol fans, who must rue the day that feisty US soccer decided to challenge their south-of-the-border supremacy). While the story is a great lens through which to view the current rivalry, what makes “Come and Take It” even better is that it comes with fantastic visuals built right in. If you haven’t seen a representation of original flag, check it out. It’s stark and beautiful. Black and white. Three components. No missed meanings; no equivocation. Since the original, the flag’s design has been remembered and modified into an even simpler, starker version that’s still popular today. As a designer, I’m inspired by flags and slogans – especially ones this direct and simple. As a soccer fan, I’m energized by the idea that cultural significance cascades through history, turning a revolutionary flag into a symbolic and good-natured challenge. Soccer is tribal. In many respects, American soccer remains a band of feisty settlers, challenging a global regime. Knowing how far we’ve come, and how much it means to be on par with the worlds’ established powers, it should be obvious that we’re not giving anything back just for the asking. The Gold Cup begins in a month. 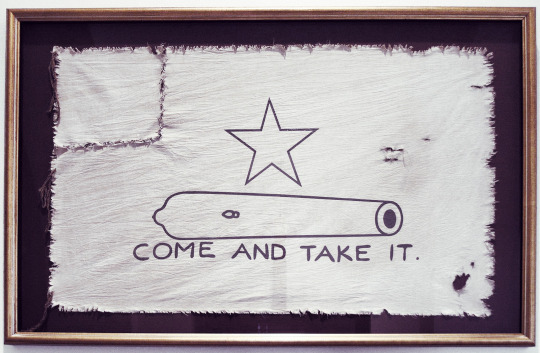 Clean Sheet Co., my apparel company, has designed a limited edition Come and Take It – inspired shirt: The Cannon. 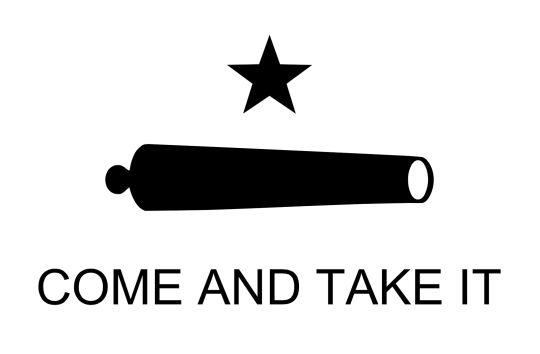 The Cannon is modeled after the Gonzales flag, with a heritage cream-colored organic cotton fabric as the base, and a stark, dark navy cannon-slogan design inked across the chest. The star in the original flag doubles as the star in the Clean Sheet Co. crest, while the crest’s shield is patriotic red and white stripes. The stripes protect something crucial – a core of bronze-gold. The meaning couldn’t be more plain: this shirt is Clean Sheet Co.’s tribute the original bronze Gonzales cannon and the settlers that defended it – and its modern equivalent, the Gold Cup and the team that will defend it shortly. The Cannon will be available in Clean Sheet Co.’s testing ground, The Lab, until June 22, and if enough pre-orders are collected, it will be made with pride and shipped to orderers before the first matches in the 2015 Gold Cup. The production run will be limited, so if you need to have this shirt, think like a Texian: take initiative, and declare your conviction for the the cause. Now is the time.